Notice the teeny tiny text on the bottom of the page: “The Videocorder is not to be used to record copyrighted materials.”. Even in 1967 Sony was worried about getting sued for people pointing their video camera at the TV. 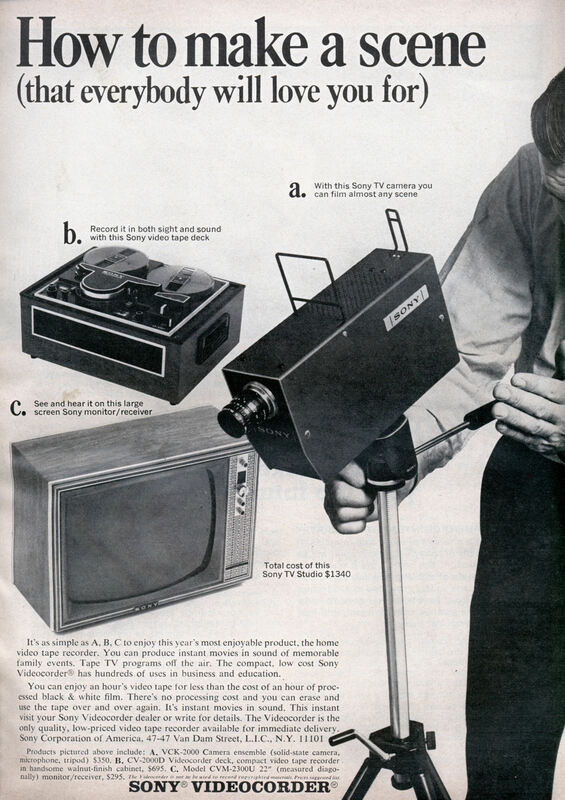 It’s as simple as A, B, C to enjoy this year’s most enjoyable product, the home video tape recorder. You can produce instant movies in sound of memorable family events. Tape TV programs off the air. The compact, low cost Sony Videocorder® has hundreds of uses in business and education. Products pictured above include: A. VCK-2000 Camera ensemble (solid-state camera, microphone, tripod) $350. B. CV-2000D Videocorder deck, compact video tape recorder in handsome walnut-finish cabinet, $695. C. Model CVM-2300U 22″ (measured diagonally) monitor/receiver, $295. The Videocorder is not to be used to record copyrighted materials. Prices suggested list. a 22″ TV was considered “large screen” in ’67? A. With this Sony Camera you can FILM almost any scene. I guess for a time of early transition, using the verb film is excusable. But, 32 years later, I still hear it. Bob Crane had a wonderfully AWFUL idea! 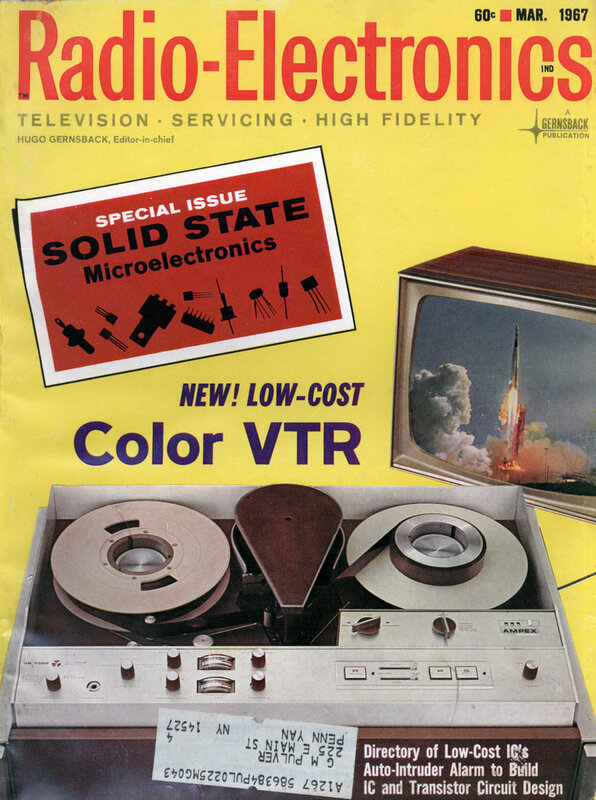 Video tape for the home or consumer was almost unheard of in 67. The word filming was a very generic term. BTW – I hear many people today saying they are taping a show on their DVR (TiVo etc.) There isn’t any tape in them. The right term is recording a show or saving a show. It takes a while for the nomenclature to change. When video games came out in the early 80s, people called the cartridges tapes even though they didn’t have tape in them, they had ROMs. One last thing, to record a TV show, even back then, you could record off the video out feed from the TV/monitor. You didn’t have to point a camera at the screen.